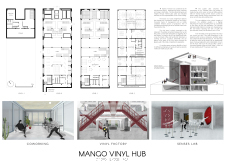 The Mango Vinyl Hub competition solicits consideration of a familiar circumstance characteristic of the contemporary regional condition. 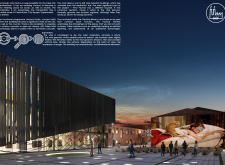 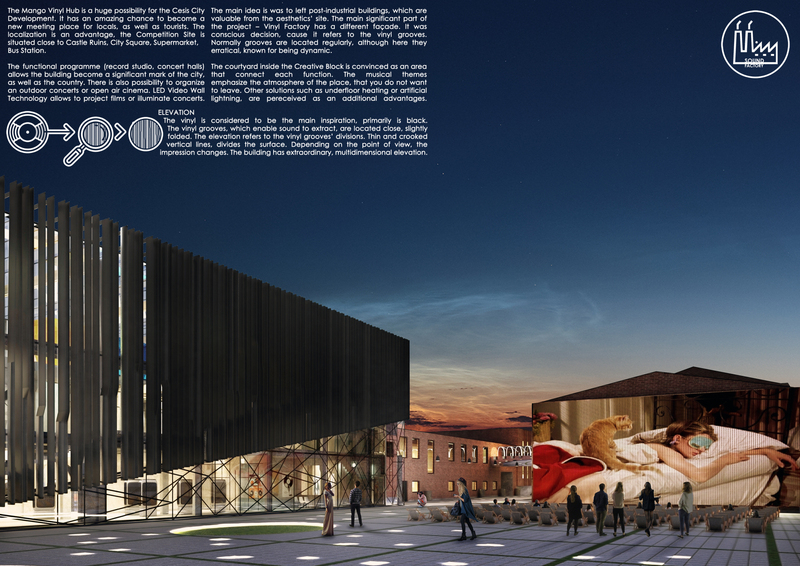 Located in Cesis, a historic and provincial city in the Vidzeme region of Latvia, the project calls into question possible and imagined futures of recent historic and artifactual culture — of architecture, music, industry, and design. 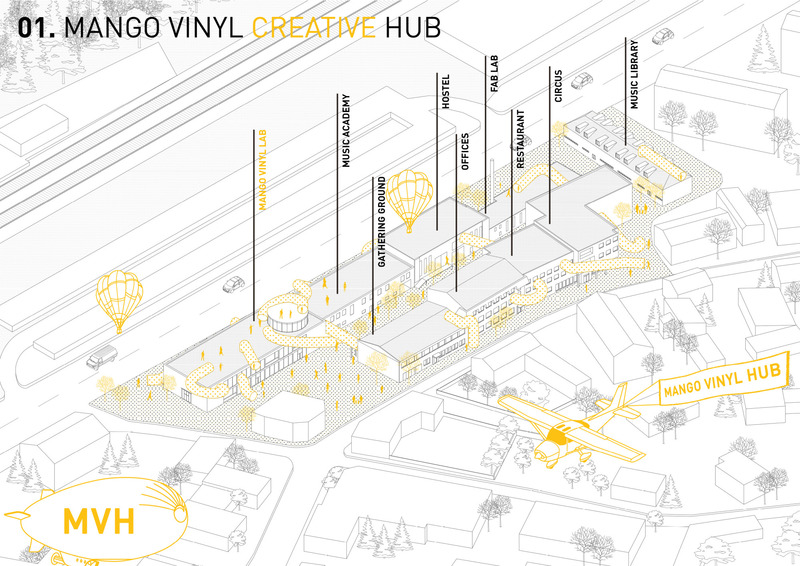 Participating in the materializing creative industry of Cesis, the project invites designers to consider the adaptive reuse of an abandoned tin foil factory in promotion of a resurgent interest in the vinyl record industry. 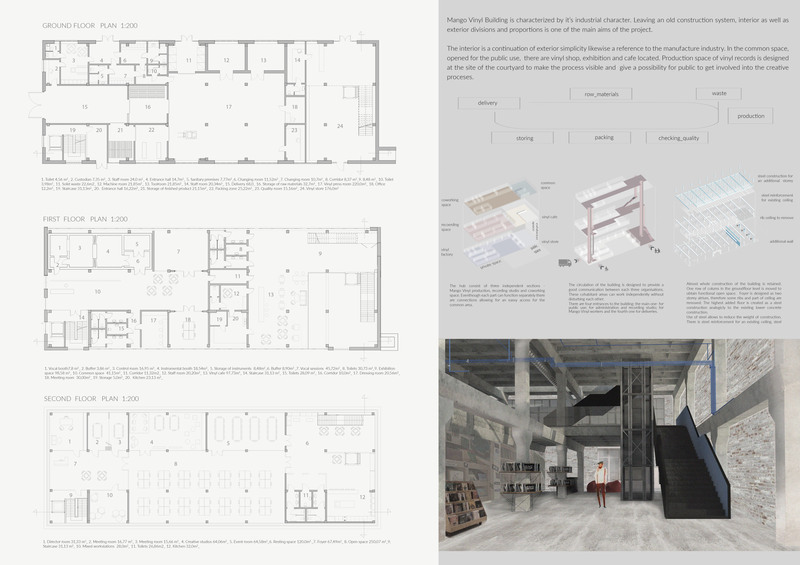 The project aptly repurposes an architecture arising from the exigency of early industrial production in support of a programmatic celebration of contemporaneous technology. 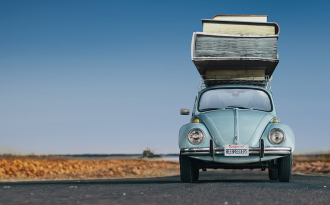 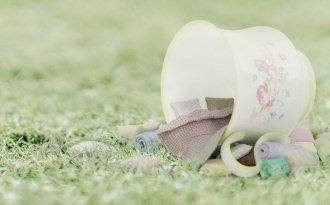 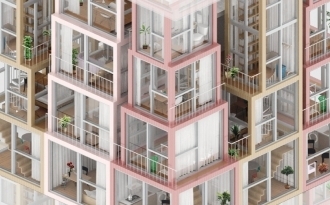 In so doing, the context provokes reflection on the value of cultural patrimony and artifact, particularly the tenuousness of obsolescence and the concurrent squander or flotsam of technological disruption. 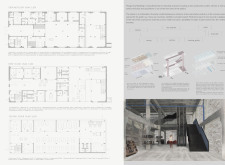 As a re-appropriation of a previous structure, the competition requires attention to programming and circulation, as well as concerns of spatiality, interiority, and public-private relation. 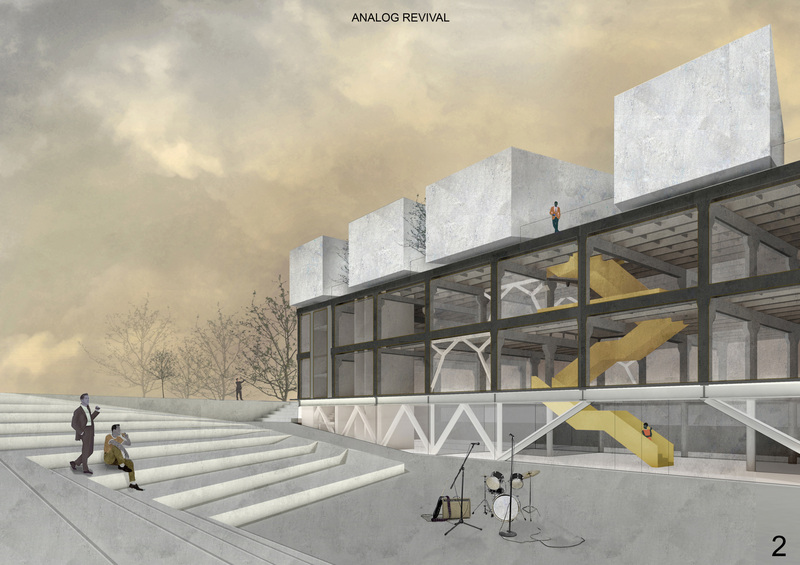 Successful projects temper the impulse of retrojecting nostalgic hallmark or tradition, through revitalization of purpose of an artifact and history of a bygone era. 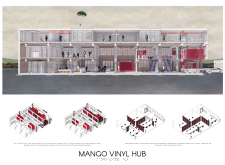 Mango Vinyl Hub competition winners revealed! 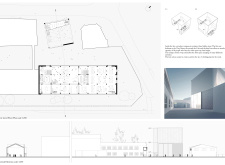 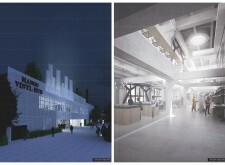 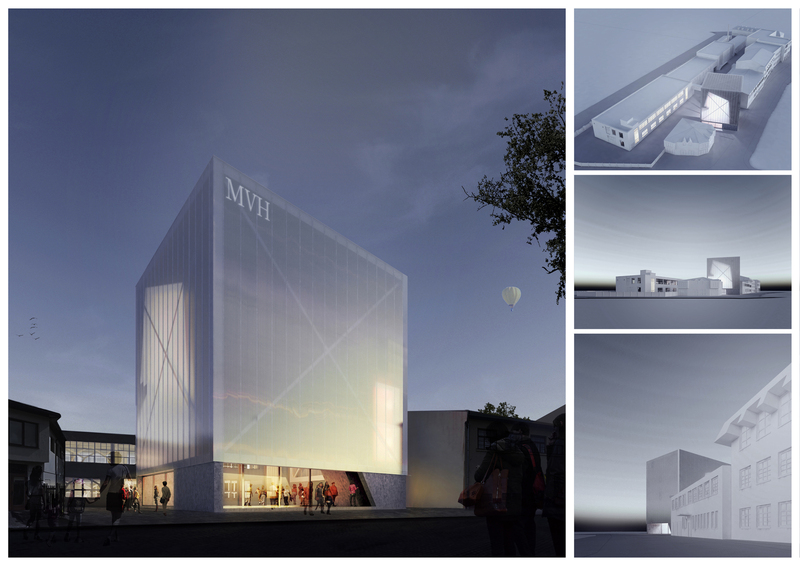 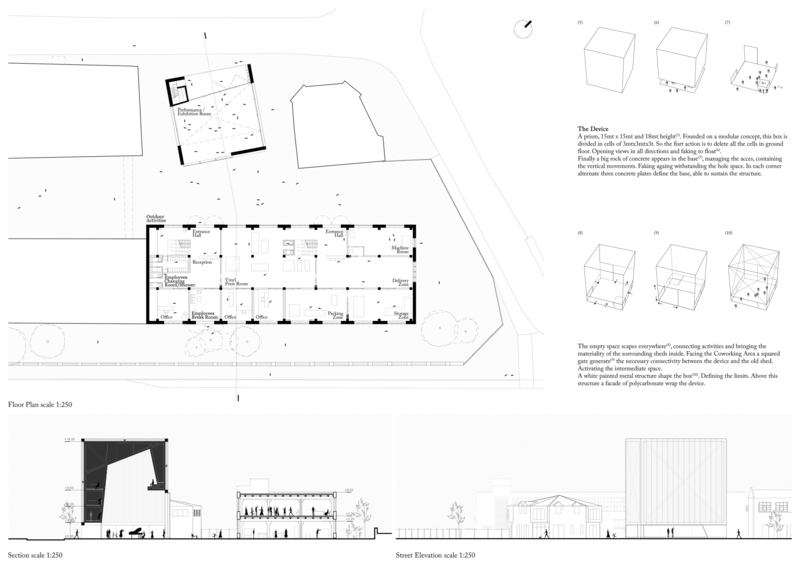 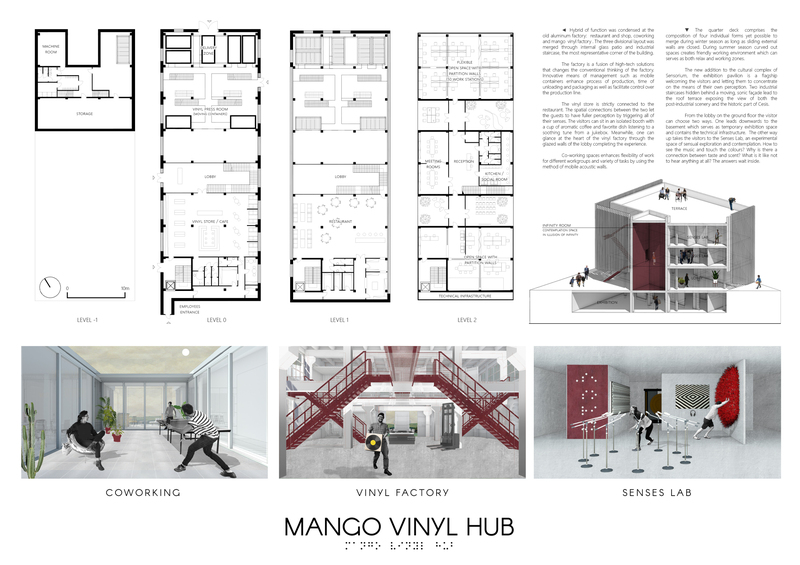 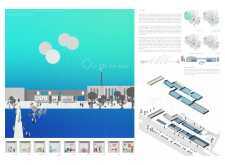 The first place proposal for the Mango Vinyl Hub sets itself apart by developing a restoratively sensitive architectural critique of the industrial work culture, transforming the abandoned tin foil factory buildings of Cesis into a new co-working campus. 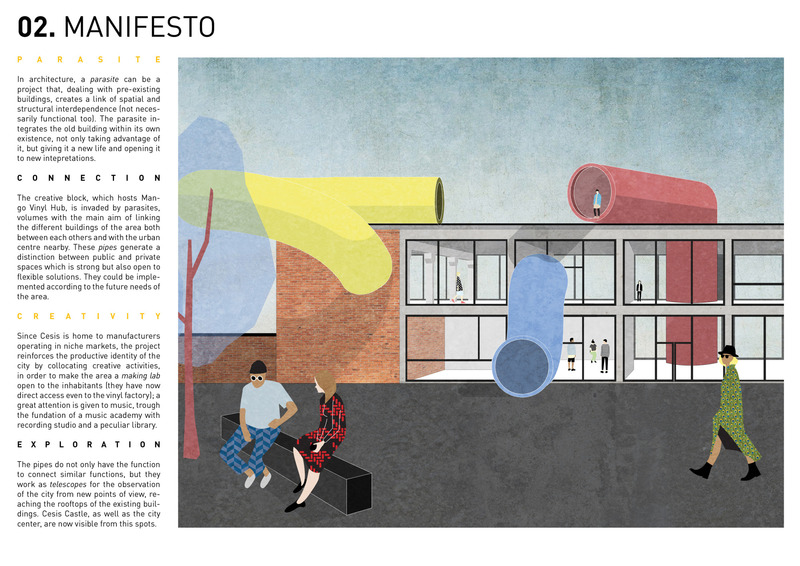 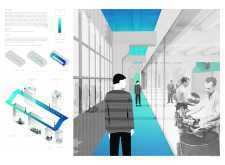 The project deploys a system of colorful, almost cartoonish, transit tubes to facilitate visual and physical connection, as well as communication, amongst the disparate programmatic components of the site. 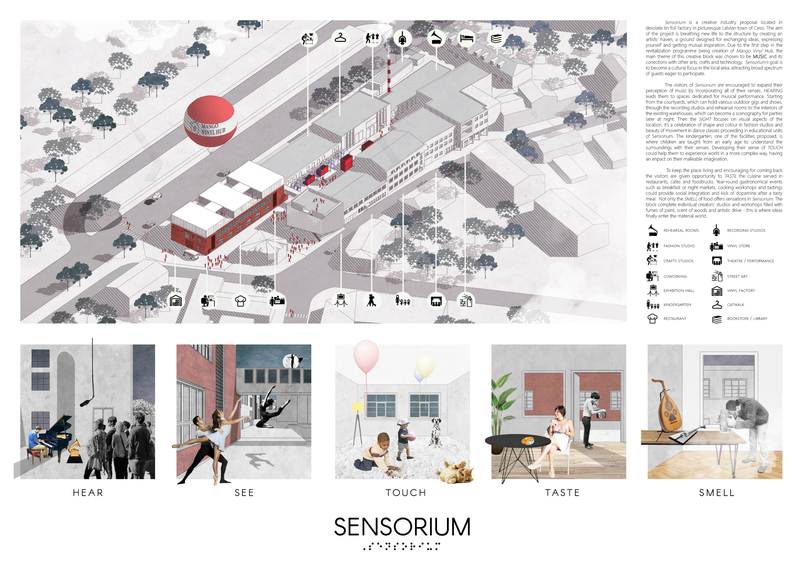 The playfully inviting presence of the colorful tubes encourages an explorative cross pollination, enticing users to visit or at minimum, peek into the different functions both public and private across the campus and the city beyond. 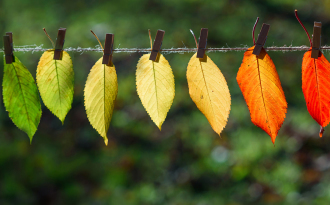 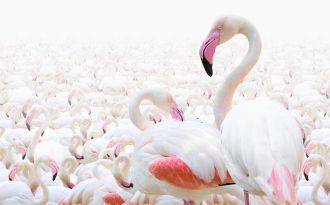 The vivacious character of the circulation and navigation, challenges common precepts of professionalism, making an argument for the inclusion of activities commonly perceived as leisure only, in work culture. 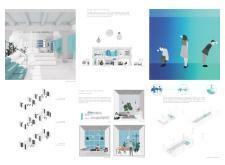 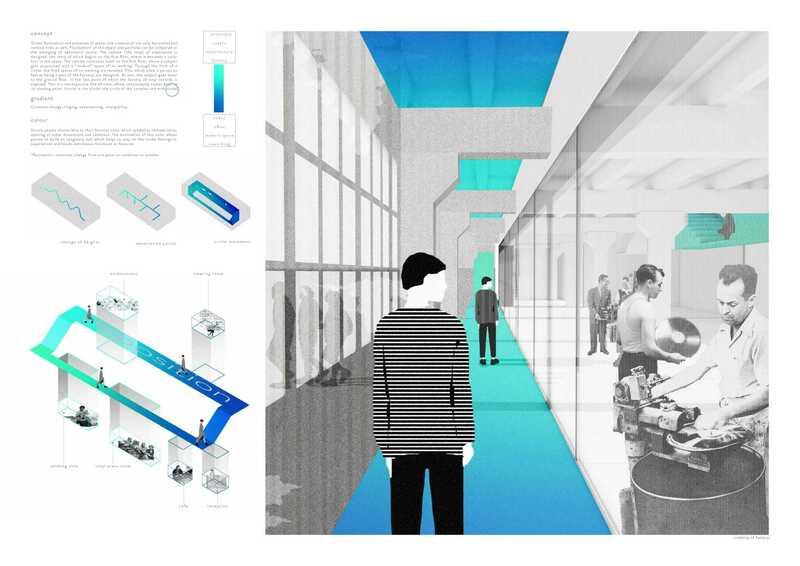 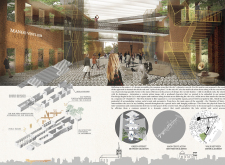 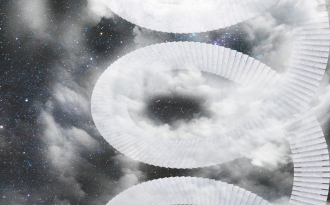 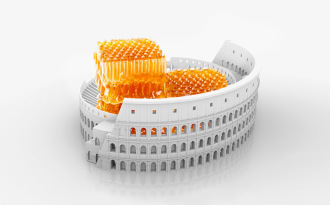 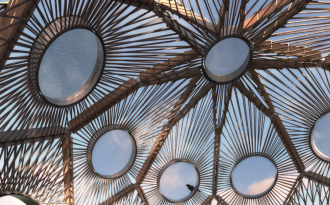 The project proposes a new architectural prototype, taking both the logic and form commonly used to facilitate city and building infrastructural connectivity, including in plumbing, conduit, and subway tunneling, and applying it to the organization of people. 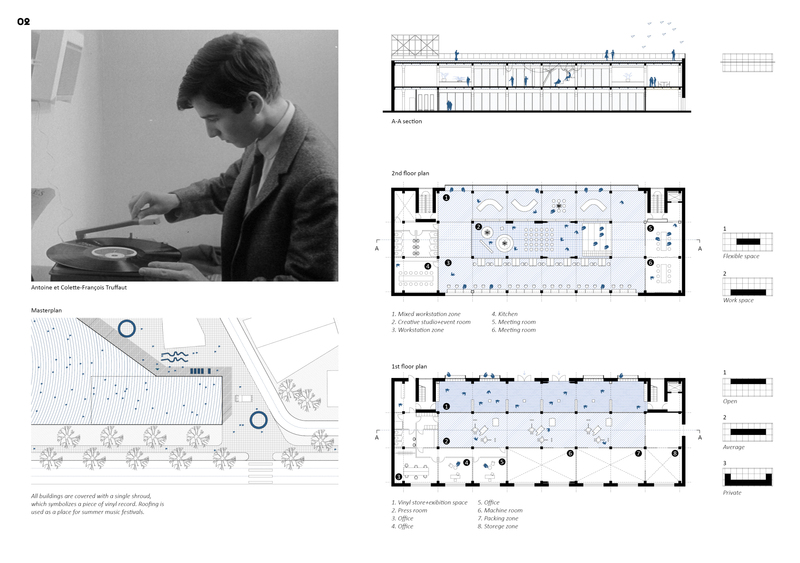 Aptly concerned with the technological artifact, the project draws parallels to the high-tech movement, evidenced for instance in the circulation strategies by Renzo Piano and Richard Rogers at the Centre Pompidou. 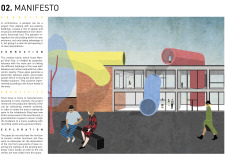 The colorful tubes generate a boisterous addition to the site, paying respect and restoring the existing infrastructure of the former industrial factory. 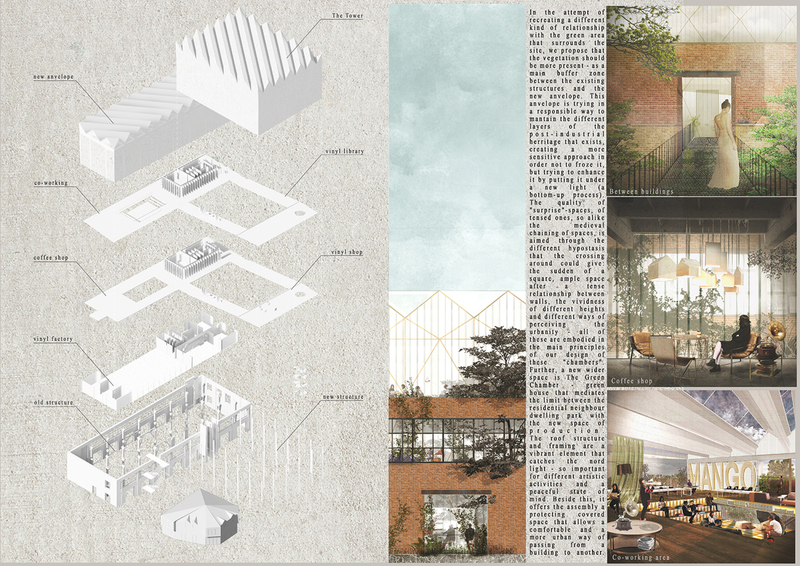 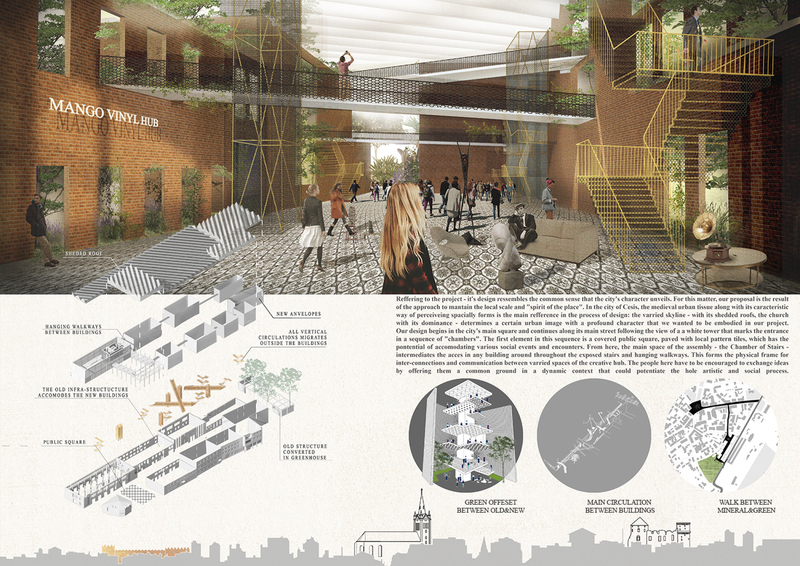 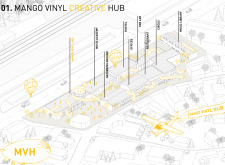 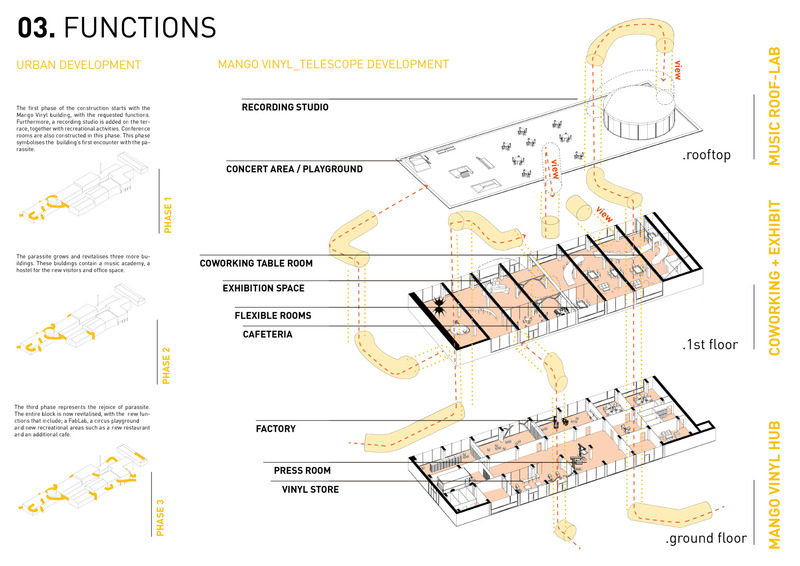 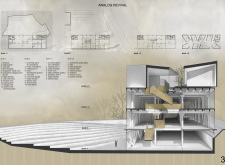 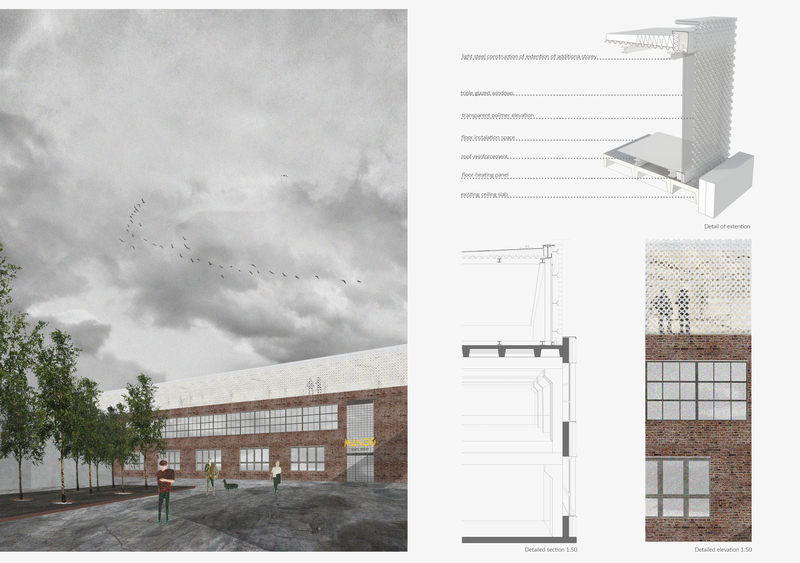 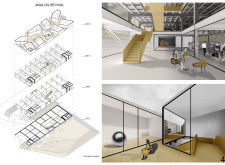 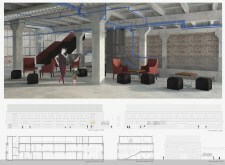 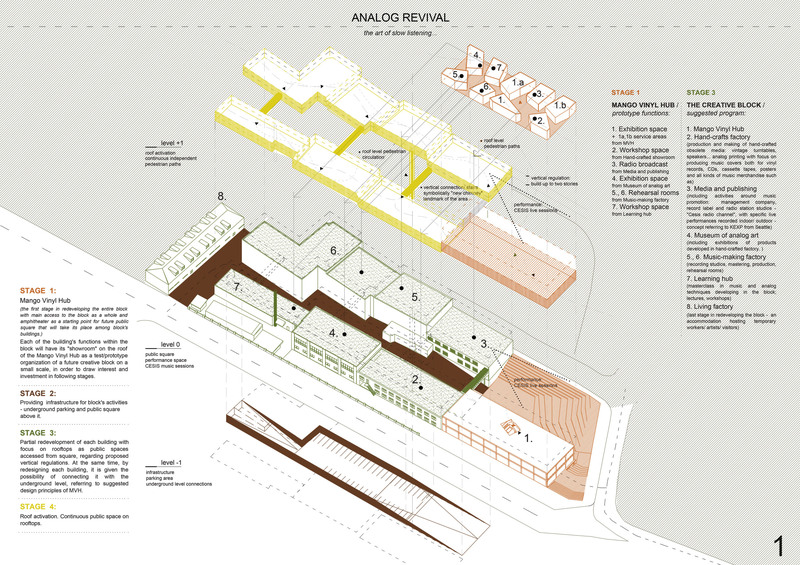 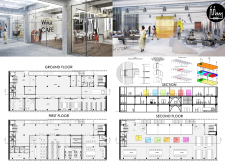 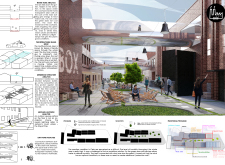 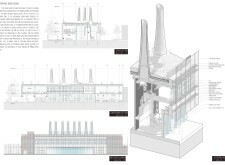 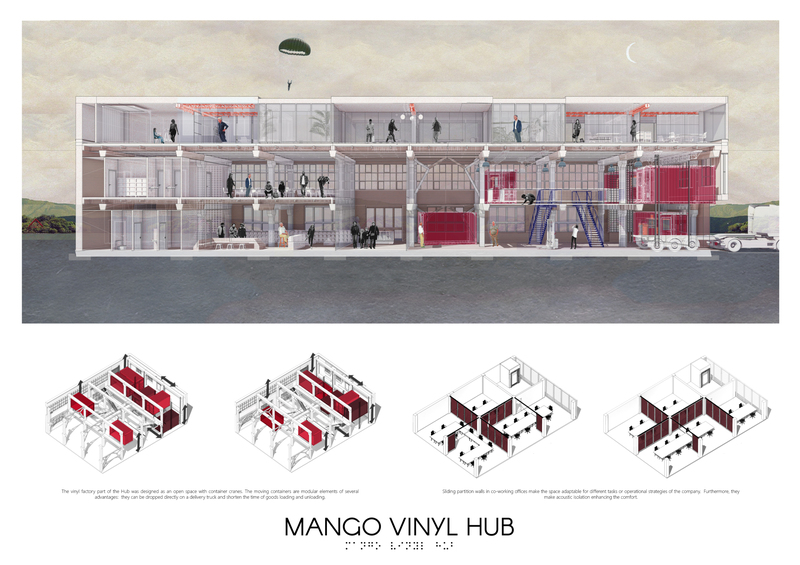 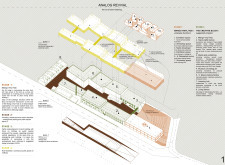 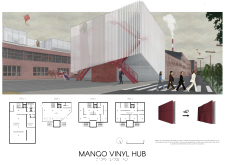 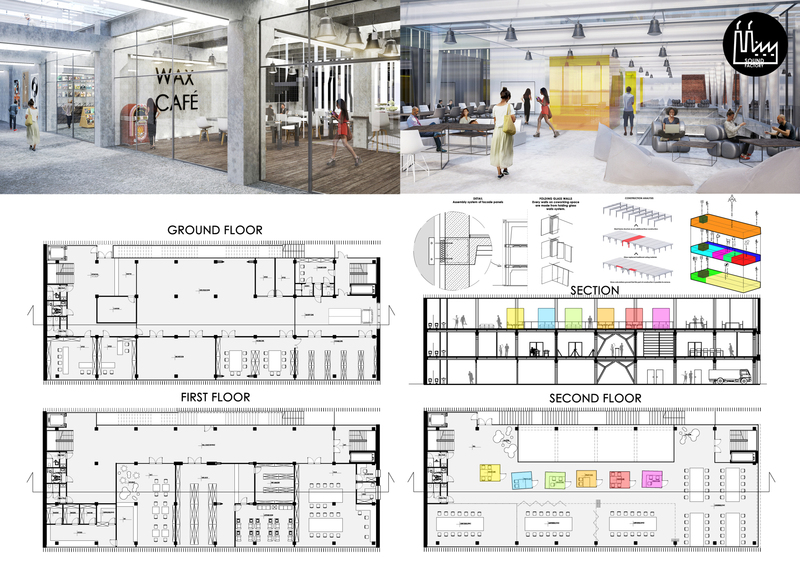 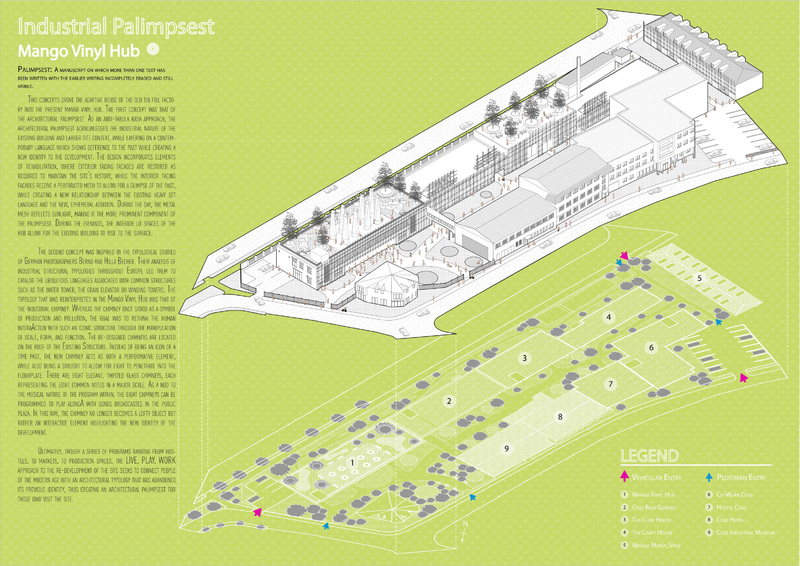 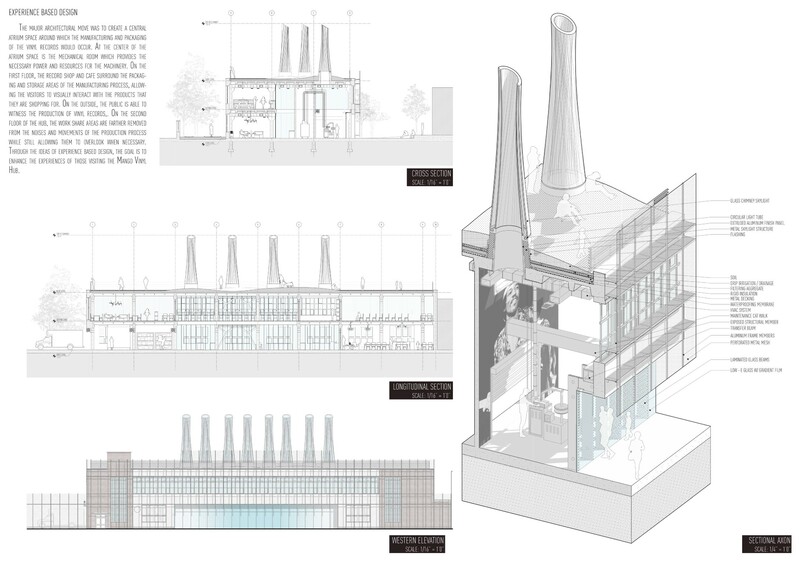 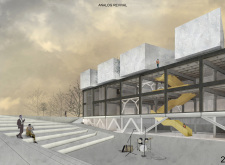 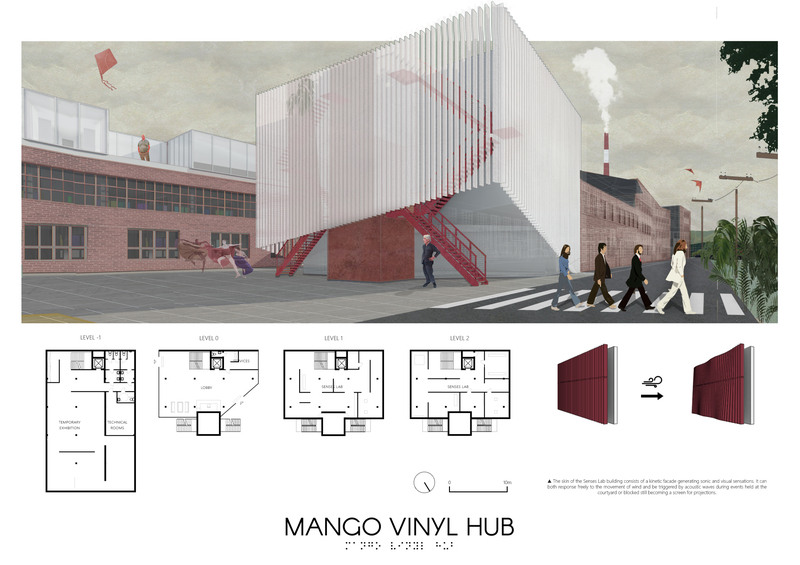 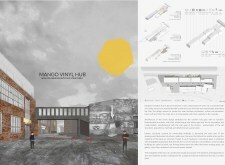 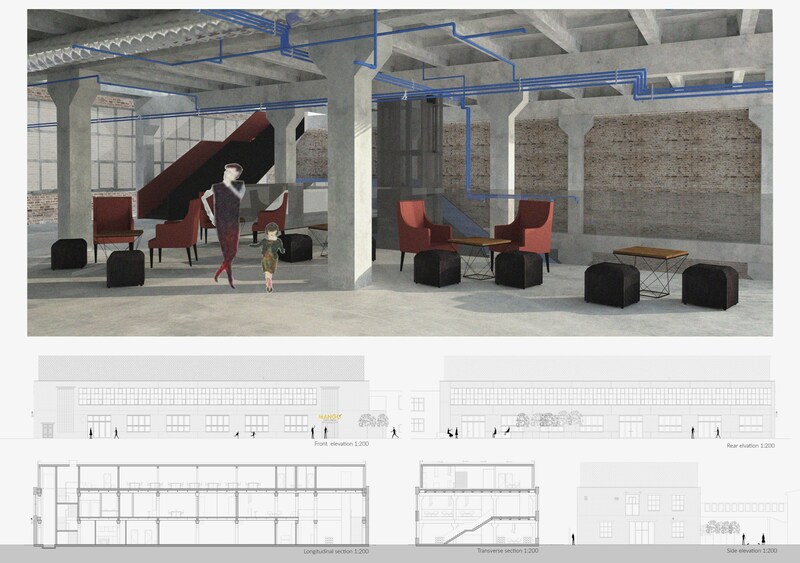 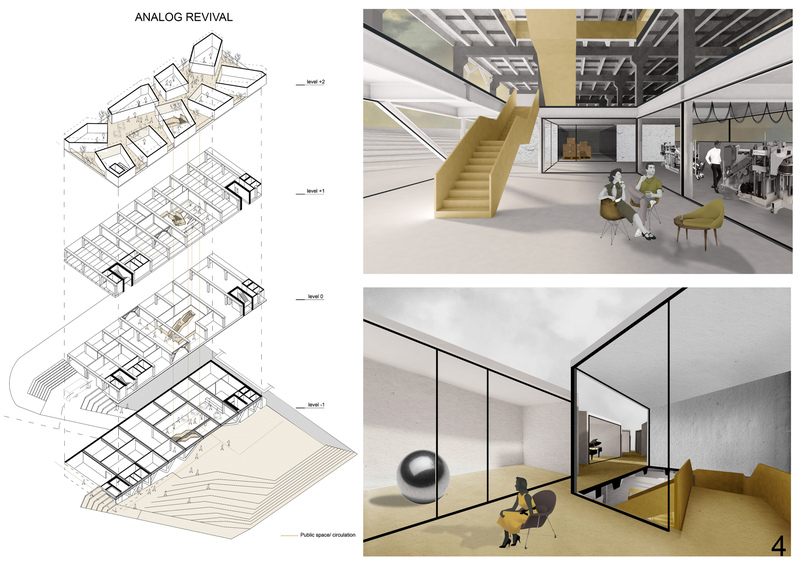 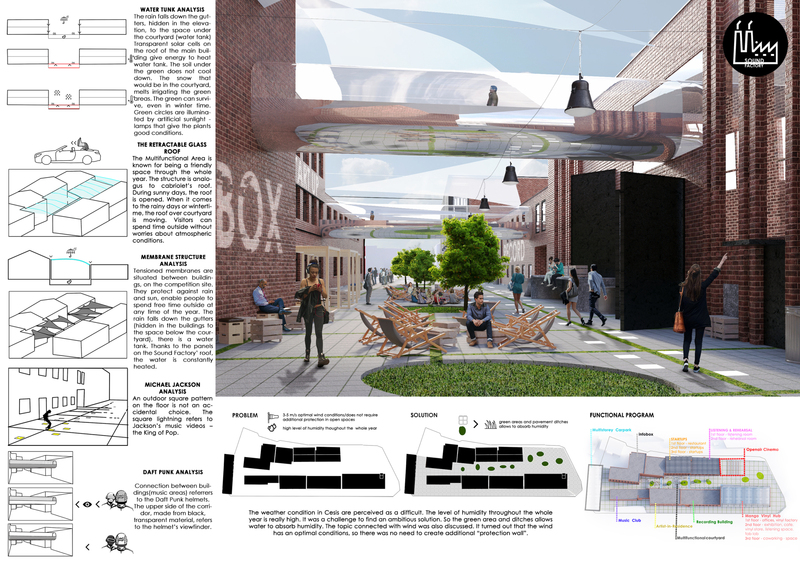 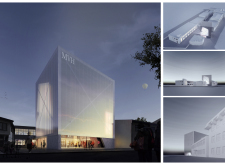 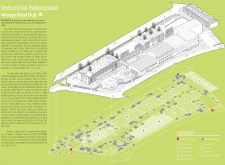 The success of the second place proposal for the Mango Vinyl Hub lies in its delineation and layering of new borders and boundaries within the structure of the existing tin foil factory to radically expose the extant industrial fabric while reviving its spaces and textures for the creative production of the emerging vinyl industry. The project first pushes all circulation into the public spaces between the buildings, freeing the interiors and creating a new public realm of dynamic interaction. 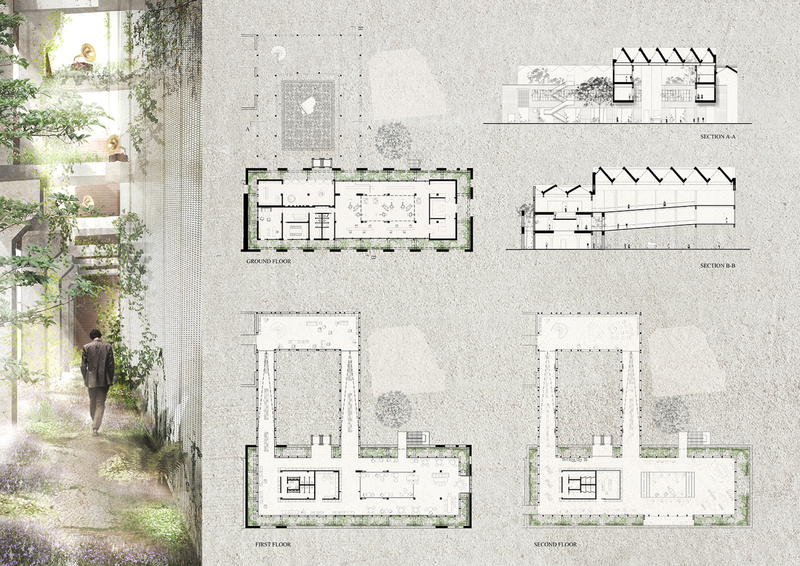 New facades of translucent mesh are then placed at selective offsets within the preserved brick factory walls, creating liminal spaces and in-between zones, blurring the interior and exterior and generating a contemplative landscaped threshold between circulation space and programmed interior. 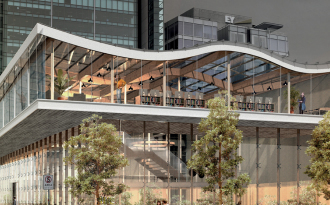 Finally, multi-directional saw-tooth roofs cap all of the spaces, modulating lighting conditions and creating a “fifth façade”, uniting the project and providing an iconic silhouette against the skyline of the city. 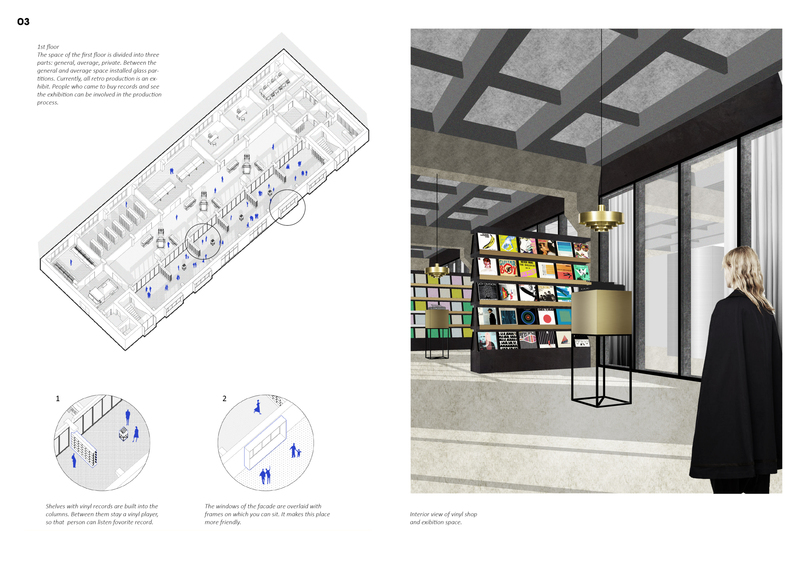 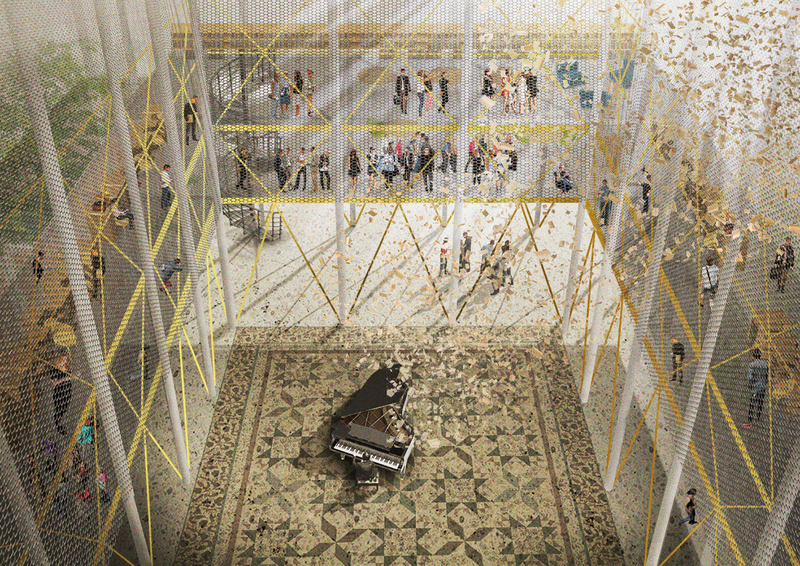 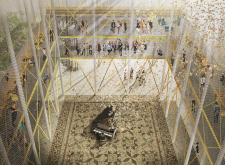 The crescendo of the project is a newly constructed tower, which acts as a portal into the new public realm and a place of gathering for the community with a large atrium space for performances surrounded by multi-level vinyl shop and library. 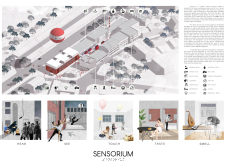 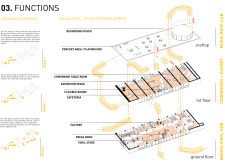 The ultimate potency of the project is its ability to both define a vibrant public space of interaction and use the blurred edges of threshold and circulation to engender a new realm for listener: a space of sound, nature, and texture both isolated and integrated into the larger project. 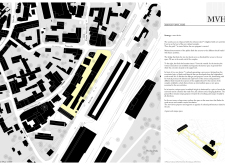 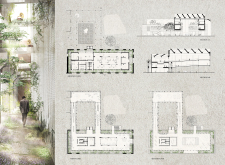 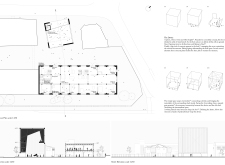 By these means, the project unites the disparate entities of the factory buildings to create a new world within, a space for creativity and collectivity which gives primacy to neither manmade nor natural, but to both. 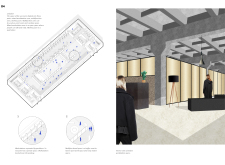 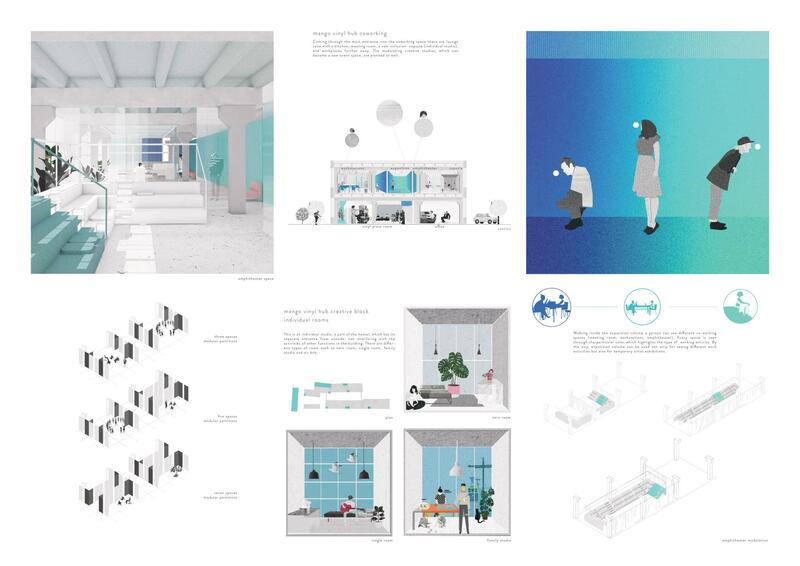 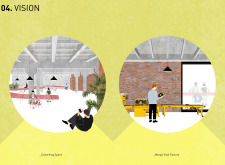 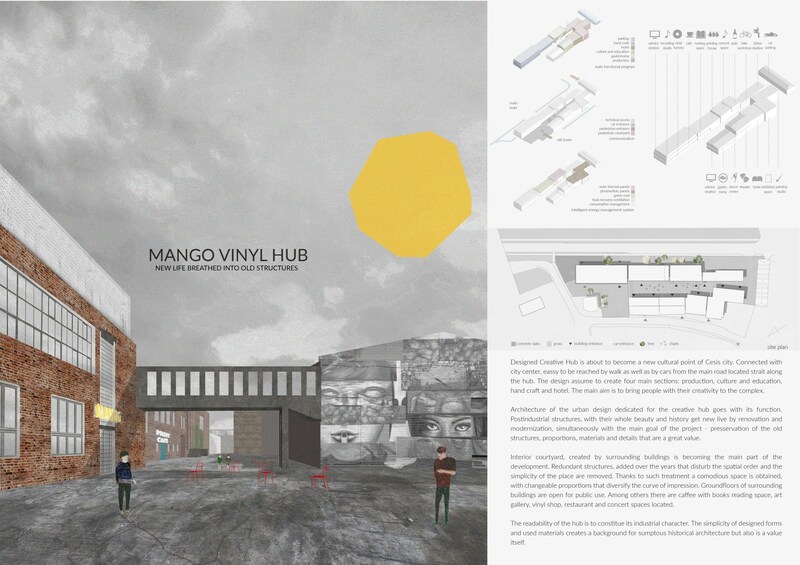 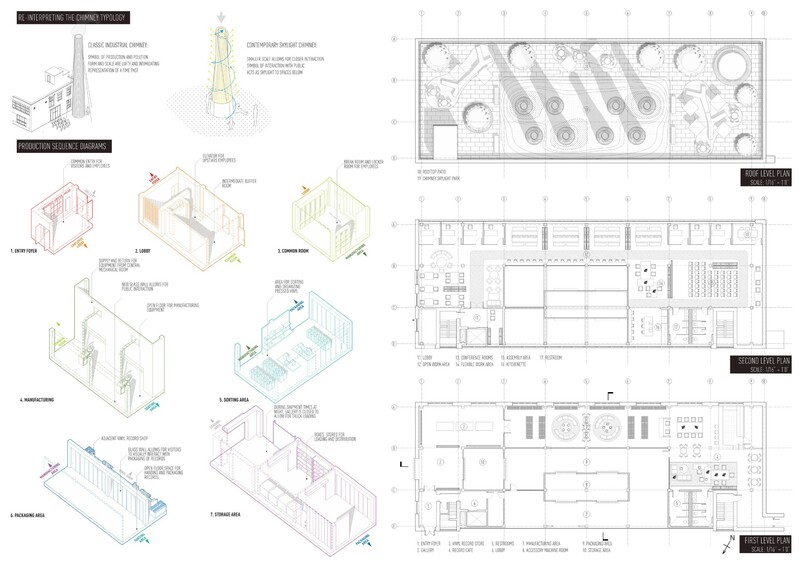 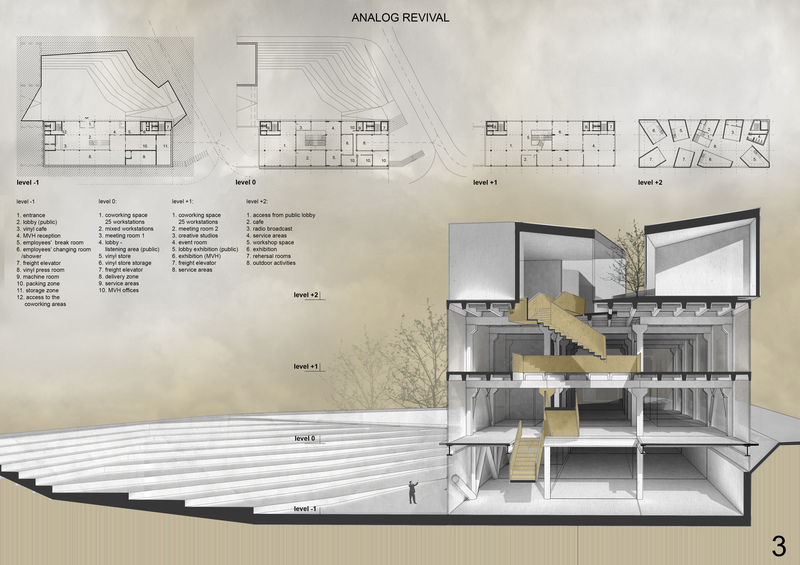 The third place entry for the Mango Vinyl Hub competition takes on the project of exposition and production to radically transform an abandoned tin foil factory into a new co-working hub, both celebrating and displaying the emergent creative industries of the area. 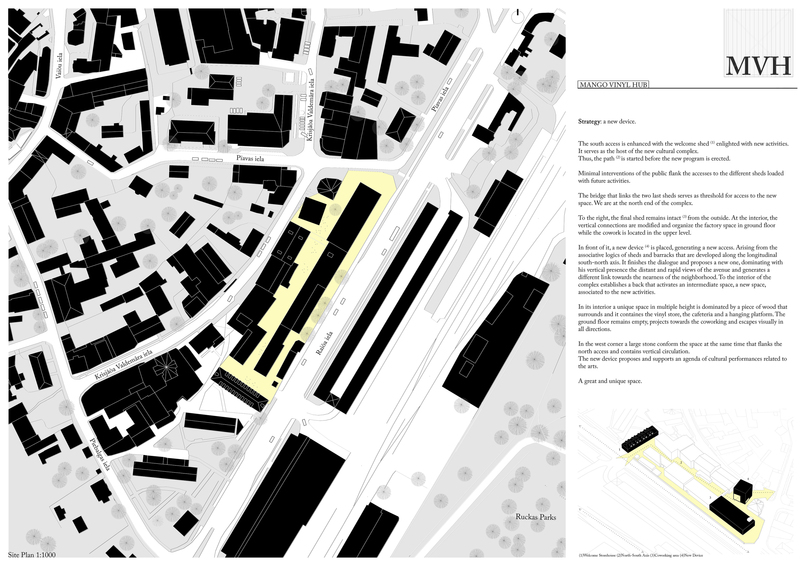 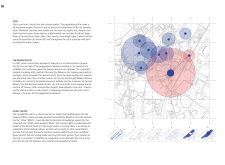 In a spatial diagram juxtaposing the market and the processes of making, the project makes explicit the tensions and collaborations between production and commerce. 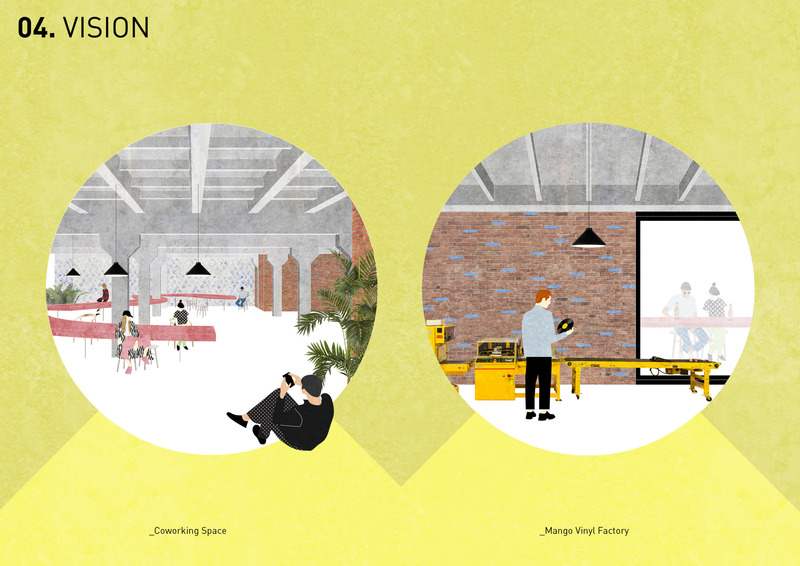 This adjacency between creative spaces of manufacturing and the continuously changing shops of the market creates a pop-up ethos, a place in which the proximity and interchangeability between maker and seller stimulates a novel type of exchange. 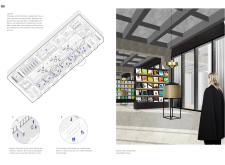 The power of the project is in the simplicity of the interior-fit out. 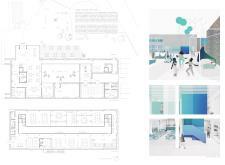 Through a simple use of vibrant color and unexpected program adjacencies, the proposal radically rethinks the place of transaction. 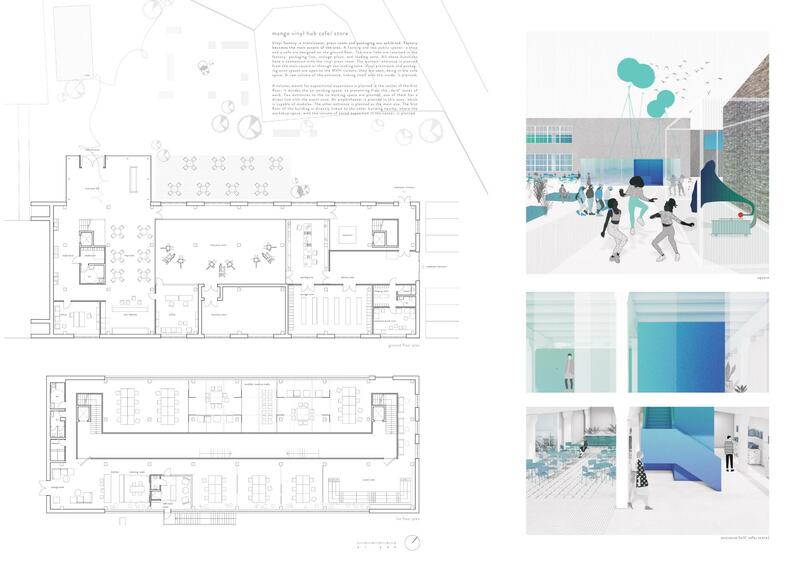 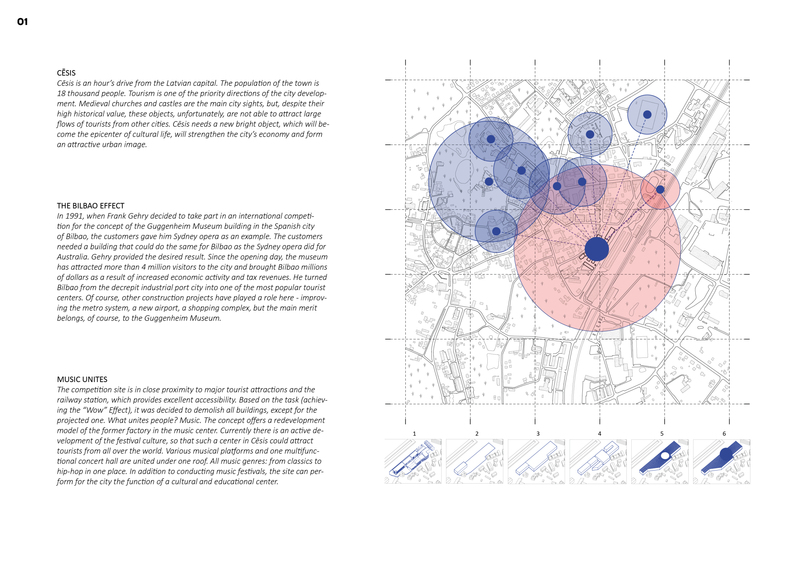 The ribbon of blue running through the project creates an urban condition within the complex, marking a zone of event and incubation, exchange and hybridization. 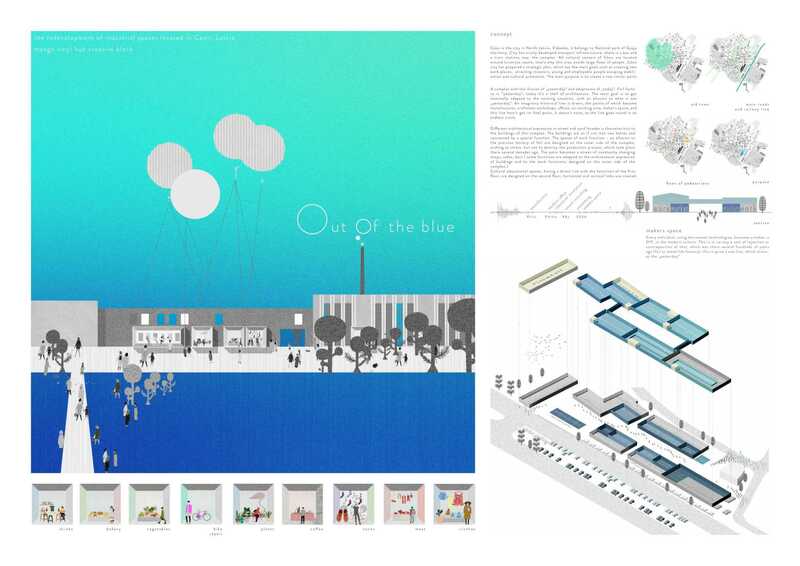 This zone of blue invites both the public visitor and the artist-makers to take part in a voyeuristic relationship of discovery and sharing, proposing a spatial diagram in which the commons is also a place of creativity and commerce.